Israeli Prime Minister Benjamin Netanyahu has worked behind the scenes for the last year to "open doors" in the Trump administration for Viktor Orban, Hungary's controversial nationalist prime minister, Israeli officials tell me. Why it matters: Orban, who has been called the "Donald Trump of Europe," leads an ultra-nationalistic government and is working to turn Hungary into what he has termed an "illiberal democracy." Cold relations that had existed between his government and the Obama administration carried forward to the first year under Trump. 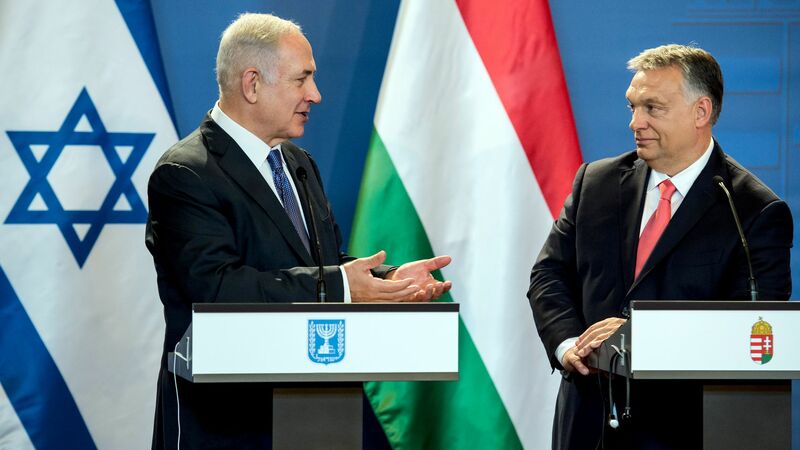 Israeli officials tell me that when Netanyahu met with Orban in Budapest last July, the Hungarian Prime Minister asked for his help in improving those relations. Hungary took steps to block enhanced cooperation between Ukraine and NATO, despite U.S. requests. Orban has very close relations with Russian President Vladimir Putin. Orban and his government went after Budapest's Central European University, which is backed by George Soros and accredited in the U.S.
An Israeli official tells me Israel's ambassador in Washington, Ron Dermer, and other Israeli foreign ministry officials approached members of the Trump administration and asked them several times to open a new page with Orban. "The message we gave to everyone who was willing to listen was that the relations with Hungary are very important and that Israel would want to see U.S.-Hungarian ties getting warmer." The Israeli lobbying efforts seem to have borne fruit in recent months. In May, Secretary of State Mike Pompeo met his Hungarian counterpart in Washington — the first such meeting in years. A few weeks later, National Security Adviser John Bolton met at the White House with one of Orban's foreign policy advisers. The latest: Israel told the Hungarians it lobbied in their favor, the officials say, and the Hungarians even thanked Israel for those efforts. Tomorrow, Orban will land in Israel for his first visit as prime minister. Netanyahu's office denied the Prime Minister lobbied on Orban's behalf in Washington.